When the carnivore comes out, sometimes you just need a good hunk of beef. To quiet the beast within, I usually go for a steak, a fat and juicy hamburger, or a roast. We've tried lots of different techniques for cooking, like long and slow, or even in the rotisserie, but for just a good "get 'er done" roast, this recipe is it. One thing I can't stress enough is using good meat. How do you know good meat from bad meat? If you can get your roast from a reputable butcher, it will be good. If it comes from Wal-Mart, it will probably be tough. Fork out the extra couple bucks for a fresh roast. Don't bother buying the one on sale that's turned a bit brown. It will be stinky to eat. And what about how much roast to buy? I go for a pound per person. I have to say, this recipe will absolutely overcook a small roast, so if you are trying to get away with only 4 pounds of meat, you should not use this recipe. We like leftover roast, so we get a tad extra. Leftovers are great on French bread with Swiss cheese and Au Jus as a French Dip Sandwich. 1. Remove the roast from the fridge. 2. Drizzle olive oil over the roast. Sprinkle with salt, garlic salt, and pepper. Massage it into the roast. 3. 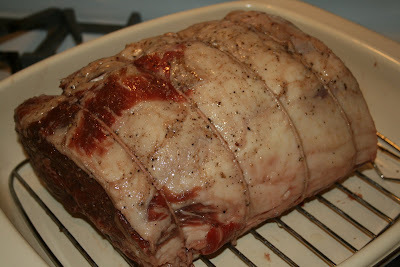 Let the roast rest, covered, at room temperature for 1 hour. 4. Preheat oven to 400F. 5. Put roast in the oven for 15 minutes at 400F. 6. Now, you have to do some math to determine how long to cook. We go for 16 minutes per pound. 16 minutes will yield medium-rare meat. I have found that 15 minutes will get you to rare, 17 for medium, or 18 for medium-well. 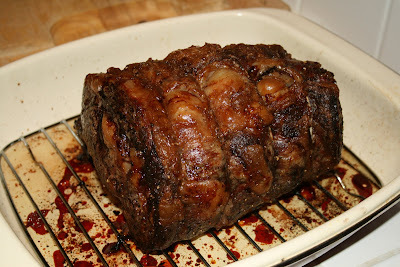 This roast was 7 lbs, 8 oz, or 7.5 pounds. 7.5 x 16 = 120 minutes total time. 7. After the initial 15 minutes, reduce the temperature to 325F and cook the remaining time. So for my roast, we had 105 minutes at 325F. 120 minutes - 15 minutes = 105 minutes at 325F. 8. Just to make sure you are on target, poke a meat thermometer in to see what it says at the end. You should aim for 10 or 15 degrees below your "Done temperature" target. For Medium-rare, we aim for 120-125F at this point. 9. 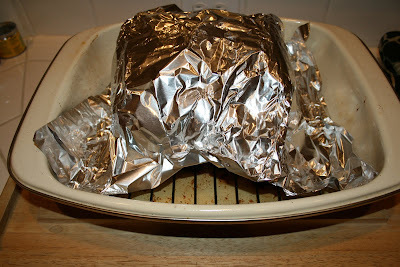 Take the roast out and let it rest in the cooking pan, covered with foil. THIS IS REALLY IMPORTANT! IT MUST REST 15 OR 20 MINUTES OR IT WILL BE UNDERCOOKED. If you are unsure, test the temperature again. For Medium-rare, it should be about 135F now. 10. 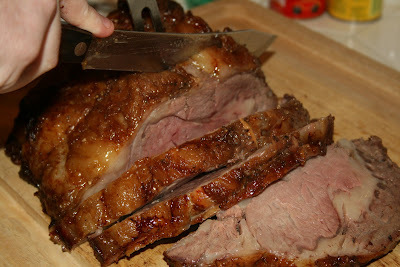 After resting, carve it up into nice thick slices. 11. 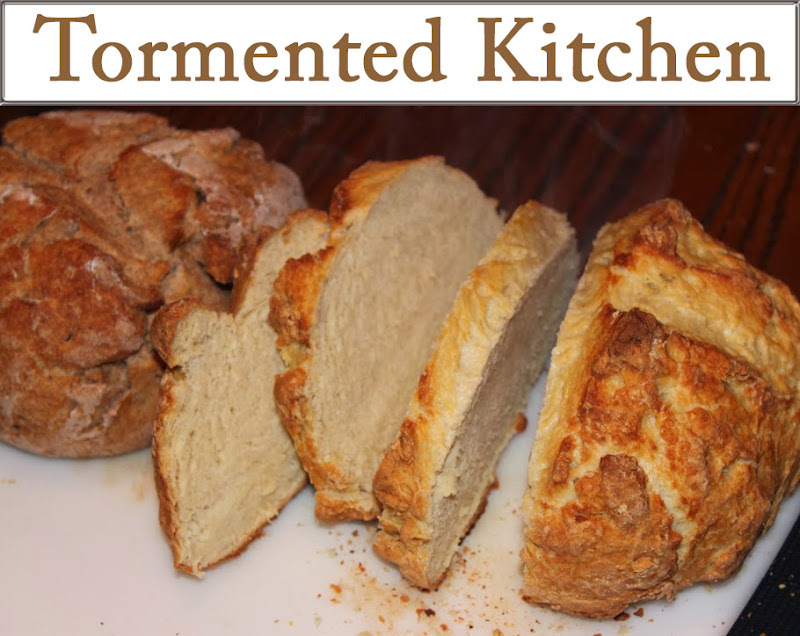 Serve with baked potatoes, a veggie like asparagus or artichokes, and some sliced French bread.